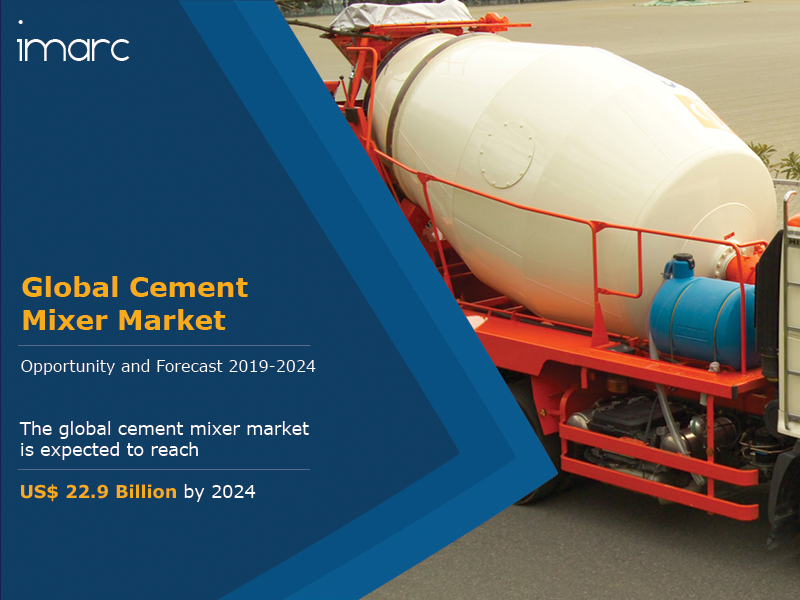 The global cement mixer market was worth US$ 14.1 Billion in 2018. Cement is made by grinding together a mixture of limestone and clay and is an essential and vital high-quality raw material used in construction projects worldwide. A cement mixer is a device that combines cement, aggregate sand or gravel and water homogeneously to form concrete or binding material. It consists of a revolving drum in which the components are introduced to be mixed. These machines are utilized across various sectors so that the concrete can be prepared at the construction site which gives the workers sufficient time to use the mixture before it hardens. Mixing of cement by hand requires intense manual effort and consumes time. On the other hand, the utilization of cement mixer at construction sites not only saves time and labor but also minimizes the formation of cement lumps. Using these mixers enhances the output of the workers and results in a relatively economical and productive process. As a result, there has been a growing trend of equipment rental and leasing across smaller firms. Apart from this, the escalating population and rapid urbanization are leading to an increase in the construction of residential as well as commercial infrastructures. This coupled with the development of smart cities across the globe is providing impetus to the growth of the market. Additionally, rising government spending on public infrastructure development is also bolstering the sales of cement mixers across the globe. According to IMARC Group, the market is expected to reach US$ 22.9 Billion by 2024, expanding at a CAGR of around 8% during 2019-2024. The report has also analysed the competitive landscape of the market with some of the key players being Caterpillar, Liebherr-International AG, SANY GROUP, Sinotruk Hong Kong Ltd., Akona Engineering Pvt. Ltd., Henan Sanq Group Machinery Co., Ltd., Lino Sella World, Shantui Construction Machinery Co., Ltd., Terex Corporation, and Zoomlion Heavy Industry Science & Technology Co., Ltd., etc. How has the global cement mixer market performed so far and how will it perform in the coming years? What are the key regional markets in the global cement mixer industry? What is the breakup of the market based on the product? What are the various stages in the value chain of the global cement mixer industry? What are the key driving factors and challenges in the global cement mixer industry? What is the structure of the global cement mixer industry and who are the key players? What is the degree of competition in the global cement mixer industry? What are the profit margins in the global cement mixer industry? 13.3.4 Akona Engineering Pvt. Ltd.
13.3.5 Henan Sanq Group Machinery Co., Ltd.
13.3.7 Shantui Construction Machinery Co., Ltd.